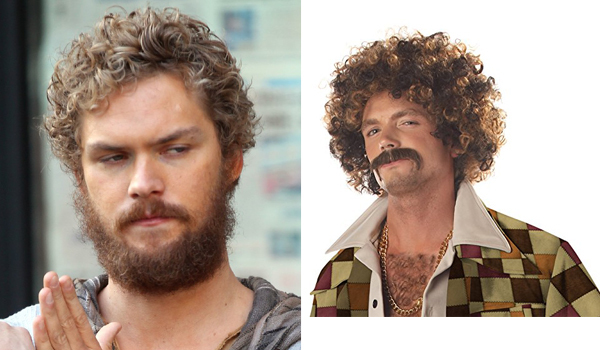 Finn Jones portrays Daniel Rand in the Iron Fist Netflix TV show. The story narrates his return to New York City after being missing for years, trying to reconnect with his past and his family legacy. He fights against the criminal element corrupting his world around him with his incredible martial arts skills and ability to summon the awesome power of the fiery Iron Fist. If you are looking for a specific one you can click on the appropriate link. The first step to look like Danny Rand (Iron Fist) is to have curly blonde hair so if you don't (which is very likely since it's the rarest type of hair) we recommend getting this wig. You can cut the hair on the wig to adjust it. You'll also have to grow a full beard if you are going for the bum-version of Daniel Rand. 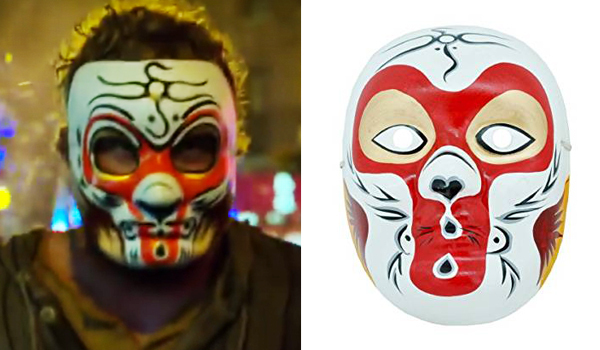 The mask that Finn Jones wears in Iron Fist for his Danny Rand role when homeless is a Beijing opera mask representing a monkey. It is probably custom made. This mask is a pretty close match. As an alternative, you can also get this skull mask and customize it yourself. 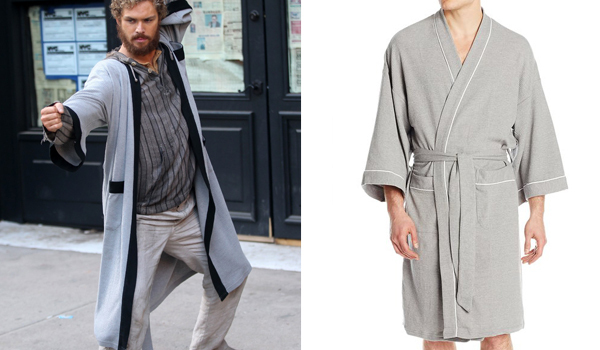 The robe that Finn Jones wears in Iron Fist for his Danny Rand role when homeless is a waffle textured kimono robe. This Fruit of the Loom bathrobe is a close match. 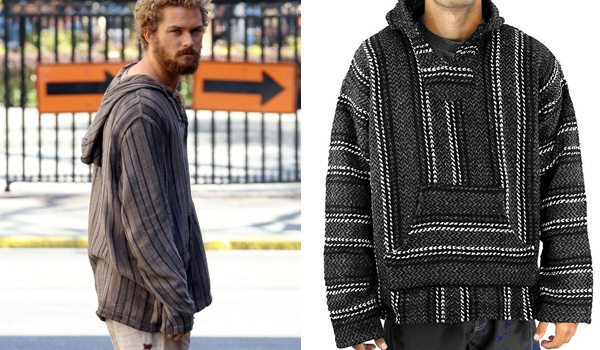 The sweater that Finn Jones wears in Iron Fist for his Danny Rand role when homeless is a vertical striped grey hoodie. This hoodie is a close and cheap match. 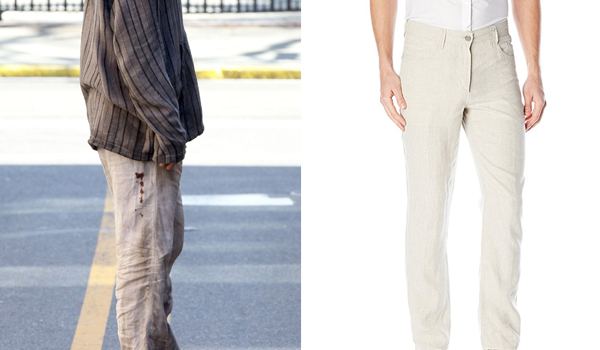 The pants that Finn Jones wears in Iron Fist for his Danny Rand role when homeless are very light beige, nearly white thick linen pants. They seem to be oversized Cubavera's. 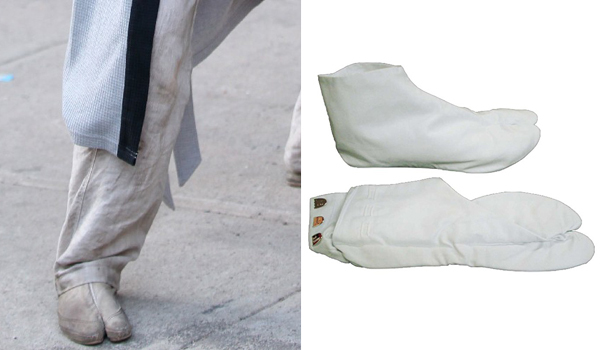 The shoes that Finn Jones wears in Iron Fist for his Danny Rand role when homeless are white cotton tabi socks. They are House of Rice's Tabi socks. 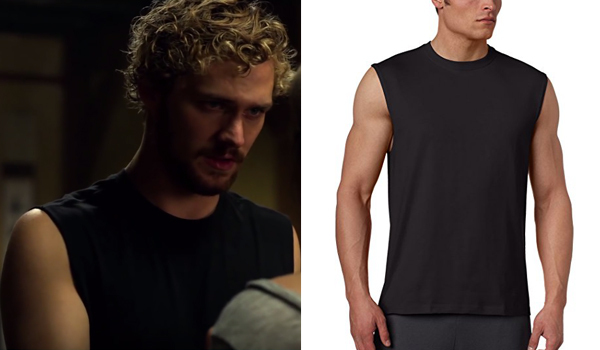 The tank top that Finn Jones wears in Iron Fist for his Danny Rand role is black and covers all the clavicular and trapezius area. 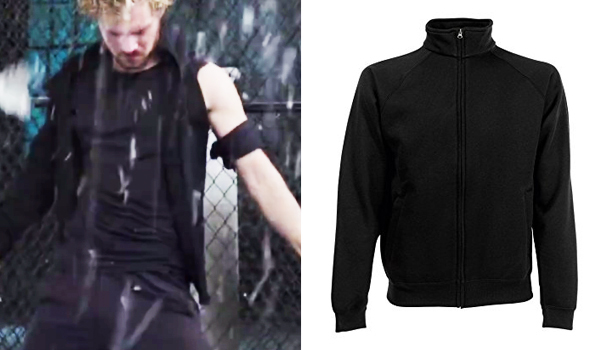 The jacket that Finn Jones wears in Iron Fist for his Iron fist black costume role is a regular-fit zip track jacket with no brand. Rip off the left sleeve so it looks just like in the show and with the fabric you can also make the arm band. The pants that Finn Jones wears in Iron Fist for his Iron fist black costume role is a slim fit black jean. The Levis 511 looks just like it, and probably is. 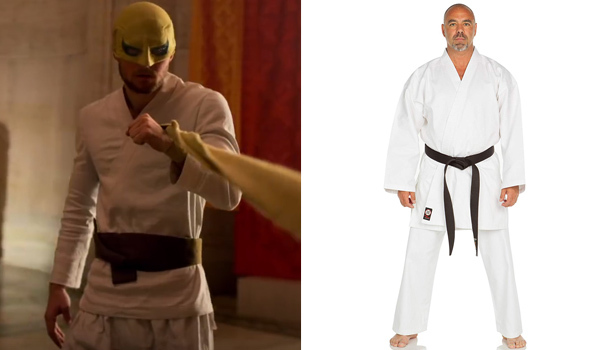 Just like in the Daredevil TV series by Netflix, the real costume of Iron Fist only really appears in season 2. The mask that Finn Jones wears in Iron Fist for his Iron Fist role when in K'un-Lun fighting against Davos is inspired by the comics mask. 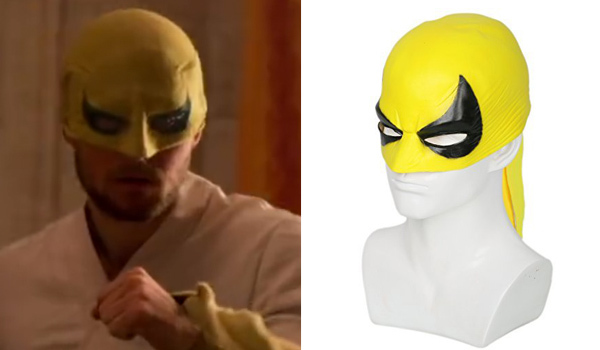 The xcoser Iron Fist mask is a great latex replica. It seems like the Ronin Karate Gi Kimono is the same that Finn Jones uses, but don't forget to get rid of the label. The belt is a piece of mustard yellow fabric nicely tied around his waist. 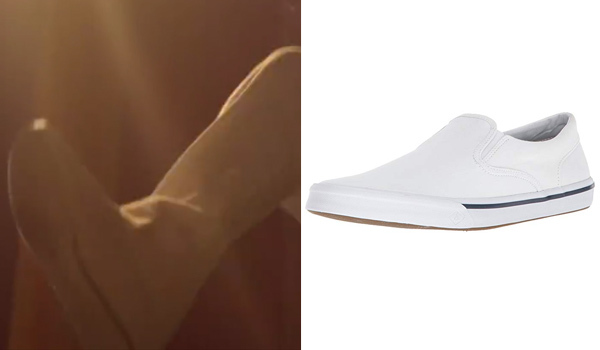 The shoes that Finn Jones wears in Iron Fist for his Iron Fist role when in K'un-Lun fighting against Davos are minimalist white sneakers. The Sperry Stripper II are a super close match. Looking for the hoodie, the sweatvest that finn Jones is wearing in the last episode, “dragen plays with fire”. From the start of the episode hè is wearing it. Thx. Can you please update with Iron Fist Hoodie Costume (Season 2)? I’m unsure whether the colours he wears are green or whether it’s just filters & lighting. I have a suspicion he actually wears a brown hoodie and a black jacket but I could be wrong.